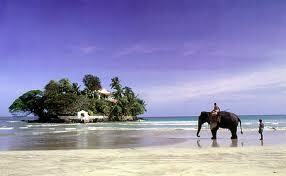 Sri Lanka is famous for its 1,600 km of unspoilt, golden beaches. It's a paradise Island shaped like a tear drop in the Indian Ocean. The people are friendly, food delicious and costs low! A stunning island filled with beaches and wild life sanctuaries, ancient cities, hills, beaches, and most of all, it's incredible beauty. 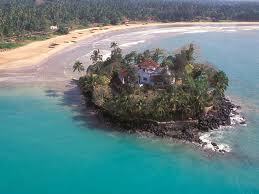 Located off the southern tip of India is the tropical paradise of Sri Lanka. This stunningly beautiful Indian Ocean island is famous for its pristine palm-fringed beaches, sacred cities, a history dating back almost 3000 years and its many National Parks. Proudly boasting eight Unesco World Heritage sites and a strong Buddhist faith, Sri Lanka attracts tourist from across the globe and is especially popular with honeymooners. Sri Lanka’s main international airport is located in the city of Columbo. Served by a great selection of well-known airlines such as Emirates, Qatar Airways and Swiss, direct flights to Sri Lanka are also available on SriLankan Airlines. The former capital of Columbo has many attractions including exquisite Buddhist temples, an Elephant Orphanage and the ancient paintings and sculptures at the National Museum. Stroll around the historic ramparts in the town of Galle, head inland to the lush countryside at pretty scenery at Kandy, explore the ancient town of Anuradhapura and discover the wildlife in one of Sri Lanka’s fifteen National Parks. The Southern Beaches of Unawatuna and Mirissa with their sparkling white sands and aquamarine waters are perfect for relaxing and sunbathing or if surfing is your thing, head east to Arugam Bay to catch some waves and spot some wildlife including elephants and crocodiles. For fantastic offers on cheap flights as well as great value lastminute flights to Sri Lanka, take a look at our great flight comparison tool at Directflights.com. You’ll find that the cheapest flights are usually found outside of the busiest times of year for travelling such as over Christmas or during the holiday periods. For the best offers on low cost flights, we advise booking as far in advance as is possible. May, the hottest period, precedes the summer monsoon rains. Most of the east, southeast, and northern parts of the country comprise the "dry zone", which receives between 1,200 mm and 1,900 mm of rain annually. Much of the rain in these areas falls from October to January; during the rest of the year there is very little precipitation. Humidity is typically higher in the southwest and mountainous areas and depends on the seasonal patterns of rainfall, and places like Colombo experience daytime humidity above 79% all year round, rising to almost 90% during the monsoon season in June. Anuradhapura experiences a daytime low of 60% during the monsoon month of March, but a high of 79% during the November and December rains. In the highlands, Kandy's daytime humidity usually ranges between 75% and 83%.